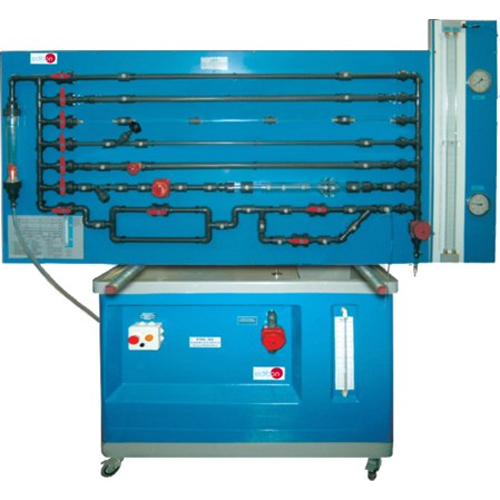 This unit allows the detailed study of fluid friction head losses which occur when a fluid flows through pipes, fittings and flow metering elements. Rapidity and facility to replace parts of the unit, in case of failure or breaking. Flowmeter, range: 600-6000 l/h. (10-100 l/min.). Rough pipe of diameter D= 17 mm. (PVC ). Rough pipe of diameter D= 23 mm. (PVC ). Smooth pipe of diameter D= 6.5 mm. (methacrylate). Smooth pipe of diameter D= 16.5 mm. (PVC). Smooth pipe of diameter D= 26.5 mm. (PVC). 2 Manometric tubes. Range: 1000 mm. H2O. 2 Bourdon type manometers. Range: 0-2.5 bar. 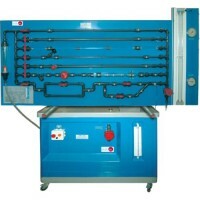 Mobile hydraulic bench, made in polyester reinforced with fibreglass, and mounted on wheels for mobility. Centrifugal pump, 0.37 KW, 30 - 80 l/min at 20.1-12.8 m., single phase 220V. / 50Hz or 110V. /60Hz. Runner made in stainless steel. Flow measurement: volumetric tank, gauged from 0 to 7 litres for low flow values and from 0 to 40 litres for high flow values.